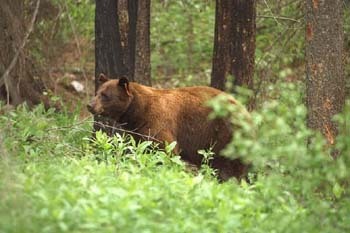 When Anne and I went to Banff in 1996, I wanted badly to photograph a grizzly bear. I thought I'd captured a grizzly with this photo, until a biologist told me otherwise (no shoulder hump, face too pointed). Even though it wasn't a grizzly, being this close to any large bear with a 200mm lens is not a very smart thing to do!